Lately I've been enjoying the special qualities of my local watershed lands. They're interesting because even though our watersheds aren't wildernesses, they have many wilderness qualities. Watershed land is put to work in the way that land works best: as a combination of soil and ecosystems that collects rain and preserves it as high-quality water. If humans have to make land usefuland no question about it, we must so we can stay alive and thrivingthen using it to turn rain into clean drinking water instead of floods is a scheme that ranks right up there with spinning straw into gold. It's like keeping part of the land certified-organic, free of pesticides and other pollution. Most Bay Area water agencies allow us carefully limited access to enjoy these clean working spaces for what they are. Our watersheds may look pristine, but they're carefully managed. The hillsides are mowed, grazed and burned under careful monitoring. The ecosystem of the 19th century, with its elk herds and grizzlies and wolves, is long gone. But the sight of grassy slopes with their wooded creases in rain and sun remains a year-round feast for the eyes. Reservoirs themselves are totally artificial, of course; they're more like tanks than lakes. They have steep and jagged shorelines, and their water levels swing wildly over the course of the year. Many reservoirs also serve as aquariums, regularly stocked with sport fish that anglers pay to come and catch. Reservoir water still needs to be processed, in tanks, with chemicals. But the sight of water reacting to wind is still an inexhaustible blessing. Watershed lands aren't destinations, like state or national parks. Their natural features aren't unusual, and to me that's a key part of their charm: they are indigenous landscapes that help me paint a mental picture of the original land that underlies everything we've built on top of it. Here's a quick look at the possibilities, from north to south. I'm focusing mainly on hiking trails, but boating and horseback riding are other common activities on watershed lands. The Sonoma County Water Agency has several reservoirs in the Russian River watershed, but only Spring Lake Park, in Santa Rosa, welcomes visitors. Typical of water district facilities, it forbids gasoline-fueled boats and swimmers from the water. 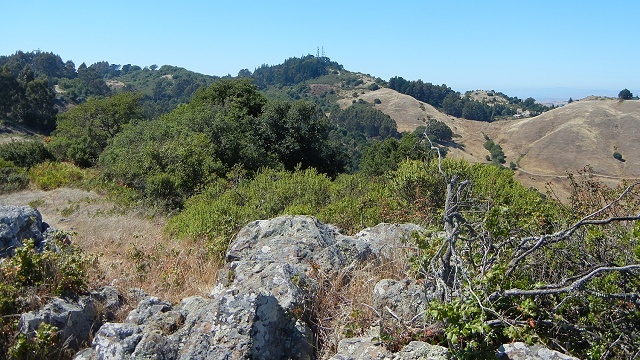 The Marin Municipal Water District has a major center of recreation in its Mount Tamalpais watershed lands, with 130 miles of trails and unpaved roads serving hikers, equestrians and bicyclists. The Contra Costa Water District operates its Los Vaqueros Reservoir, east of Mount Diablo, as an intensive recreation resource including more than 50 miles of trails. The San Francisco Public Utilities Commission manages the watershed around its San Mateo Peninsula reservoirs, the ones you see west of I-280. Hikers can visit this land on the Fifield-Cahill Ridge Trail only as part of a supervised hike, but it's a beauty. The East Bay Municipal Utility District manages big chunks of land around its reservoirs behind the East Bay hills. These include 80 miles of trails, accessible with a very inexpensive pass. It also has watershed land in the Sierra foothills. The Alameda County Water District, serving the Fremont area, has no reservoirs because its local supply is the groundwater of the Nile Cone. But it has a unique "watershed" property where 19th-century gravel quarries on the Cone now serve as recharge ponds, and within the last 20 years the area has been developed as Quarry Lakes Regional Recreation Area. Finally, the Santa Clara Valley Water District has several reservoirs in the foothills of the Santa Cruz Mountains, access to which is managed by the county and San Jose city governments. It also has 70 miles of trails along the creeks and holding ponds of the valley floor. Find maps on this page.